In the midst of a ferocious comeback, an animated New England Patriots offense stands at the thirty yard line of the Colts side of the field. Down by four, the Patriots need a touchdown to win, but as the clock ticks down under thirty seconds, the virtual Tom Brady and Co. face a second and fifteen, making the next play a crucial one. The pressure is on me to make a surefire yet surprising play call or I may be handing Madden bragging rights back to my brother. Out of curiosity – and a bit of desperation – I turn to a supposedly smarter football mind for advice; I Ask Madden. And the first suggestion offered to me by the simulated John Madden in this crucial position: a fullback hand off. This is just one example of a situation familiar – and hilarious – to most Madden veterans. The Ask Madden feature of the popular football video game is laughably inept at play calling. A Hail Mary in the middle of the third quarter? Sure. Goal line formation on defense on first and ten from midfield? Makes sense. Punt the ball away on third and six? Why not. The amusing inability of the Ask Madden feature aside, the recent above example did get me thinking a bit, especially since it was in the midst of fantasy football draft preparation season. In a way, Madden and fantasy football are sort of like brothers, both offspring of America’s football obsession, but there’s normally not much interaction between the two siblings. Yet integral to both games is the ranking and evaluation of players, so after I fumbled away my Madden bragging rights, I got to wondering how player rankings in both games interact with each other. I started my investigation by collecting data from the last three NFL seasons. Using ESPN’s fantasy football website as my baseline, I went position by position with the website’s preseason top 40 quarterbacks, top 85 running backs, top 90 wide receivers, and top 35 tight ends for 2012, 2013, and 2014, checking how each player ranked in both Madden and at the end of the fantasy football season. I then deleted any players that were made outliers by injury or suspension (e.g. Adrian Peterson last year or Aaron Rodgers in 2013), since it would be unreasonable to expect either projection system to predict such variables. Once consolidated into one data set, those records gave me Graphs 1 and 2, seen below. 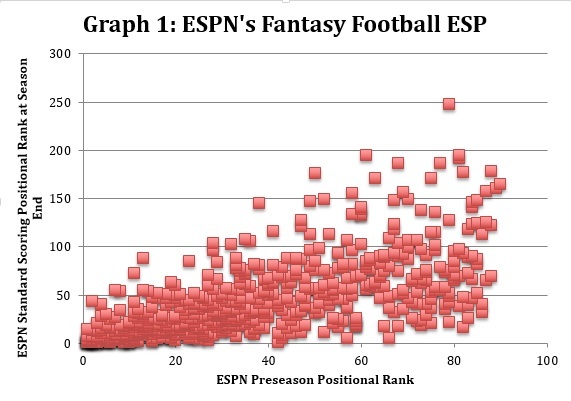 The correlation coefficient between ESPN’s preseason rankings and the season’s end rankings is higher in every single category than that between Madden’s rankings and the season’s end rankings. That means that ESPN’s rankings were typically a better predictor of fantasy success than Madden’s rankings were, as they demonstrated a stronger linear relationship with fantasy football positional rankings. 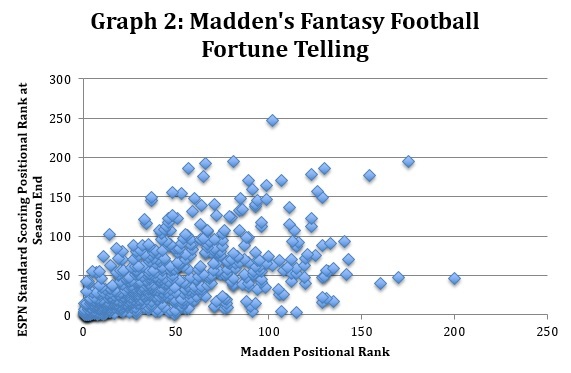 In fact, the quarterback position is the only category in which Madden ratings displayed a strong correlation – a correlation coefficient greater than 0.6 – to fantasy football, while ESPN displayed such a connection in three of the five categories and was close in the other two. Don’t get me wrong, Madden didn’t entirely fall flat on its face. It did actually show at least moderate correlation at each positional group. How does Madden rate as a fantasy football projection system then? Well, like with most prognosticators, you could definitely do better, but, at the same time, you could probably do a lot worse. So, if you’re feeling the pressure and not sure what to do – like I was with my own Madden bragging rights on the line – or if you’re just looking to make things a little more interesting in your fantasy football draft this year, you could always try to Ask Madden. I am in the championship who do I start Brady or Ryan? I think you are really onto something here, and wouldn’t discount your results immediately. You are only missing the other important variable which is player opportunity (to make yards, score, get receptions which is a function of the team they play for, their role in that scheme, and a lot more). This can explain for instance why a generational talent wide receiver playing for a losing team behind a bad quarterback would not be great for fantasy purposes. I would be more interested to know if Madden ratings accurately capture a player’s ability / talent. Let’s say player performance (fantasy points) = player ability x opportunity. Forecasting one player’s opportunities for a whole season of weekly games that hasn’t even begun yet is a pretty big challenge, but I bet the best fantasy experts have a decent idea. I bet the Madden ratings capture player ability better than the fantasy experts who must make too many guesstimates of lots of variables to arrive at their rankings / projections. This approach would especially help ranking novel player situations (like a veteran player moving to a different team and role, or a rookie in a starting position).